Overall, in 2018, we spent about 64’000 CHF. This is 7000 CHF more than in 2017. This is not really good to increase yearly expenses by 10% in one year. However, there are some things that changed in our life that explain that. Personal: 21557: Everything that is for us. Holidays, shopping, gifts, Visa fees, health fees, gym and so on. Apartment: 16027: Here is the rent and the power bills that is all. State: 7343: All the taxes at all the different levels (country, state, and county). Insurances: 6641: Health insurance, legal insurance, and insurances for the apartment. Food: 5493: The name should be self-explanatory! Transportation: 5264: Everything related to our car, to train, taxi and things like. Car insurance is in this category. But plane tickets are in Personal for holidays. Communication: 1753: Our internet and mobile costs mainly. Also, a few services that I use on the internet. I do not think it is too bad. But for 2019, I am going to try to reduce the impact of the Personal category. There should be fewer things in that category. We spent a bit too much on non-mandatory things. Now, we can start taking look at some of the expenses in particular. I am not going to go into details for every single expense of the year. This post would be too long. I am going to go over the biggest expenses and the interesting expenses as well. If you would like to know how much we spend on something specific, do not hesitate to ask in the comments below! Rent – 15’000. Rent is by far our biggest expenses. Last year, we reduced our rent by about 5%. Unless the reference index falls again, there is nothing we can do to reduce it further. Taxes – 7300. Taxes are a big part of our budget. Next year, they will significantly increase because of my new job. I may do a second pillar contribution to reduce this if our finances are good enough. Wedding – 6400. Last year, we got married! I will go into details of this one in the next section. Holidays – 5700. 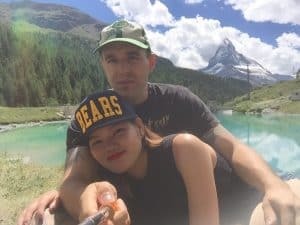 We went on honeymoon last year and we had to pay twice for the flights to China. I also had to take some unpaid leave which makes a big cost as well. This year, we should spend less on our holidays I think. Health Insurance – 5400. This is significantly more than last year because we are two people paying them now! And next year it will be even more since we have improved our health insurance coverage. Health insurance in Switzerland is going up in price year after year! It is crazy that the five biggest expenses in our budget are making up for more than 60% of our entire expenses. For most of them, there is not a lot we can do to reduce them. That will mean we are quite limited in reducing our expenses for next year. We are going to need to get creative! In the previous section, I said that we had 7000 CHF more expenses this year than the previous one. This is mostly due to our wedding. It cost us about 6400 CHF. We do not regret this cost a minute! 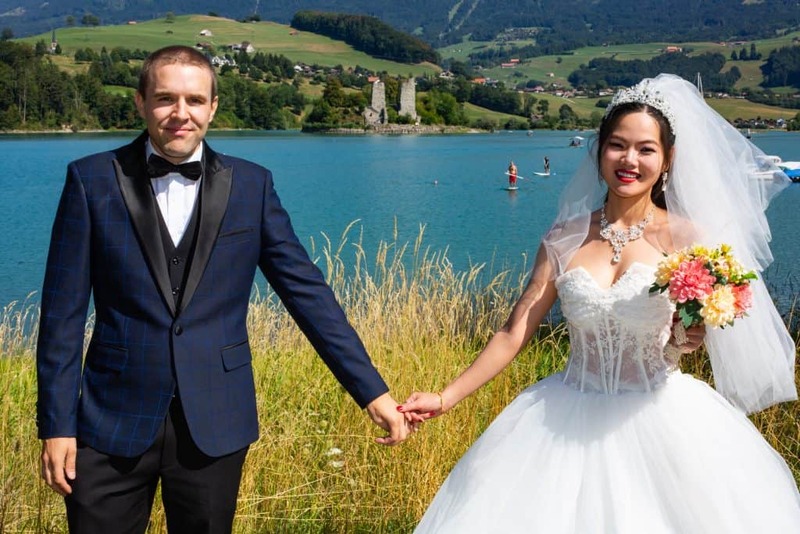 This was a wonderful day and we still managed to keep our wedding at a very reasonable level for Switzerland. However, this is a cost that will not show up in 2019. I am expecting our average to go back down to about 5000 CHF per month next year. Actually, this will be one of my 2019 Goals. Groceries is one of our biggest remaining expenses. In 2018, we paid 3646 in Groceries. I am really satisfied with this number! It is only 300 CHF per month for two people. For comparison, in 2017, I spent 4532 CHF and I was alone to eat on that budget. We really managed to keep our food budget in control. Since Mrs. The Poor Swiss arrived, we are cooking more and buying more in bulk. Our freezer is always packed with good price meat and things that we cooked ourselves. I do not think we have anything to change for 2019 on our Groceries. I am considering whether we should buy a bigger freezer. But that probably will not be for 2019. Our gas expenses for our car are up to 1280 CHF this year. This is 50% more than last year. The reason is quite simple, we are going to many more places with Mrs. The Poor Swiss than I was going to when I was alone. When I am by myself, I rarely go out. But Mrs. The Poor Swiss likes to go places. So we have been going out with our car far more than usual this year. I do not think it is a big deal since we are still at around 100 CHF per month. This is reasonable for our transportation budget I believe. I do not see a change next year. It may even get more expensive next year since Mrs. The Poor Swiss will be there for the entire year. And since she is almost done learning to drive, she may drive on her own as well. In 2018, we spent 963 CHF on our internet plan. This is quite good I believe because it is half of what I spent in 2017. In 2018, I was able to reduce my internet bill significantly by changing to a simpler plan. This is a really good reduction. We now pay 80 CHF per month. However, this is still a large amount of money, almost one thousand francs each year. Since I do not download as much as I used to do, I will consider downgrading our plan to a cheaper one in 2019. The current plan is actually faster than what our home line allows. The lower plan would halve the current download speed. This could save us around 180 CHF per year. One of the other big expenses in our budget is the power bill. In 2018, we spent 957 CHF. It is quite high. But it is good because it is more than 100 CHF lower than in 2017. And in 2016, it was even higher than that. We are on the right path to reduce our power bill. For 2019, I plan to reduce the number of computers that are running, as part of my 2019 Goals. That will definitely mean some lower consumption on that part. I am also going to try to power off more things when we do not use them. I hope I can bring the power bills down to 800 CHF in 2019. We had to pay 630 CHF for health-related fees in 2018. This is in addition to the immense amount of money that we pay for health insurance. I went twice to the dentist for controls. I also went once to the doctor for a stomach bug. And the rest is a few times we had to go to the pharmacy for both Mrs. The Poor Swiss and me. It is a bit sad that we have to pay so much for health while we pay big health insurances. But at least neither of us was seriously sick. And neither of us goes a lot to the doctor. We should be able to keep our health costs below 1000 CHF in 2019. On 2018, we spent 550 CHF on Gym for Mrs. The Poor Swiss. I was also going for the gym but not paying because I was managing the website of the gym center. We now both stopped the gym at this place. The hours were not convenient enough for me with my new work schedule. In 2019, I plan to start again going to the gym. I will find one center that is closer to my office and to which I can go before going to work in the morning. I am currently doing too many hours at my work and as such, I can cut it down with some gym every day. Mrs. The Poor Swiss is probably going to start a dance course in 2019. So we are going to spend more money on that this year. However, I think it is very important to stay in good shape. Especially for me who sits all day long in front of a computer. I am a big coffee drinker. I drink around five coffees per day on a workday. And probably around two or three on my days off. Generally, we are drinking Nespresso coffee. I almost never drink coffee outside of the home because the price is simply not reasonable. And coffee is free at my work. In 2018, we spent 271 CHF in coffee. This is more than I thought. We have a Nespresso machine at home. In 2018, we drank a mix of Nespresso coffee and some cheaper alternatives that work in a Nespresso coffee machine (mostly Lidl). During the first five months, I also purchased coffee for my previous company. But this amount is bigger than I thought honestly. Since I drink most of my coffee at work and it is good coffee, I will not buy Nespresso coffee anymore for the home in 2019. This should save us at least 200 CHF this year! I think I can easily live with only Lidl or Migros coffee at home. From my analysis of our 2018 expenses, I have found out a few things that could be improved for our 2019 budget. Most of these I have already discussed in each of the previous sections. But I wanted to summarize them here. Switch to cheaper legal insurance. After looking at it, I have realized that my insurance was actually quite expensive. I think we are going to be able to spend less in 2019. But it is going to be difficult because some of the expenses will increase (health insurance and gym for instance). So, in 2018, we spent about 64’000 CHF. It is a bit too much I think. Our goal for 2019 is to cut it down to 60’000 CHF. It makes 5000 CHF per month and we think it is attainable and reasonable for the long-term. 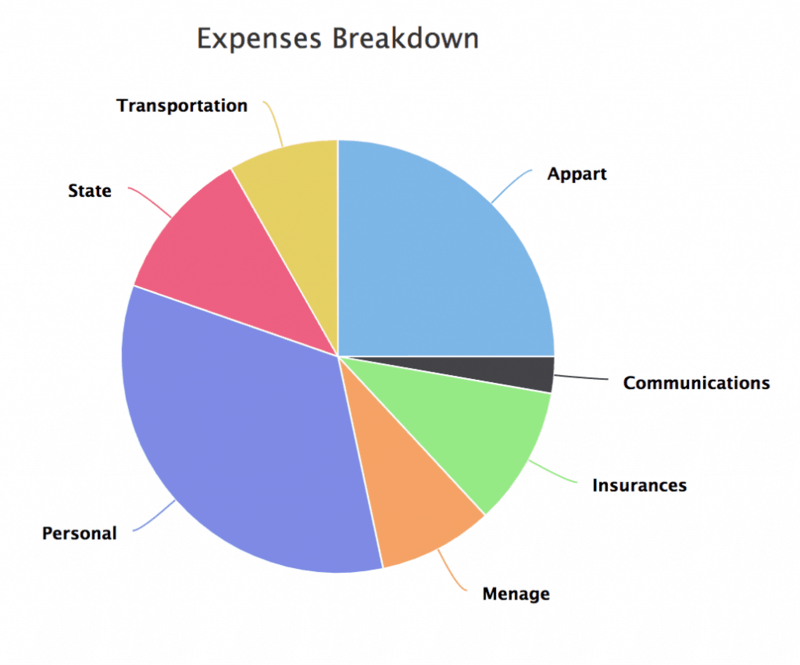 There are a few things that we can do to improve our expenses as seen in the previous section. However, there are also expenses that are guaranteed to become more expensive, such as our new health insurances. And we will start sport again. It is going to be challenging to go under 5000 CHF each month. But we are going to do our best for that! What about you? How much did you spend in 2018? How much do you plan to spend in 2019? It is the first time I do it really in depth for a year. But it showed me a lot of things. I will definitely do it again next year! You should try to do it once. It can show you many things that monthly breakdown don’t show. Good luck with your blog! Unfortunately, I can’t read Spanish. Taxes seems quite low. Is that only for 1 person? For meat, we buy almost everything at Aligro, especially the Pork and the sausages. We do not buy really good parts, but we buy in bulk. We then cut the meat in portions, and freeze them in vacuum bags. We also buy quite a lot of Chicken at Lidl. Taxes are indeed low. It is for only one salary (mine) and it is based on my old salary. There is no doubt that with my new salary, this will increase significantly! Very good details !!! And a very good target for 2019 !!! You are an increase Mr.poor Swiss. Let’s try to meet our goals for 2019! I am sure we can do better! I think your transportation costs are inaccurate because you have to cover some car insurance, and perhaps maintenance or lease costs too. I can suggest one life hack – Facebook Market Place, is very good place to buy some used items, e.g. bigger freezer for relatively low price. Are you talking about the 5264 CHF or about the 1280 CHF? The latter is only for gas not for the entire costs. The former is all transportation costs, mostly car but also some public transportation. My car cost me around 4600 CHF per year everything included. Thanks for the tip about Facebook Market Place. I know about it but I tend to forget it because I hate Facebook! I need to pay more attention to it. Previous Previous post: Buy or Rent – Which is Right for You?